See the recording of the talk here and photos of Dr. Suchman’s visit here. See the campus announcement of the talk here. Friday, March 3, 2017 – 11A-12P, NCSA Auditorium, 1205 W Clark St, Urbana, IL on the University of Illinois campus. Abstract: This talk explores the question of how we might engage both critically and generatively with the contemporary figure of innovation. I suggest as one resource the concept of location, as it has been articulated within anthropological, feminist, and (post)colonial research. I take as a starting place the premise that we cannot think about innovation separately from the political, economic, and disciplinary histories that imbue that word with its currency. More specifically, we need to attend to the ways in which the professionalisation of design in the last century, in the midst of kindred projects in modernist rationalisation, has included a legacy of hegemonic claims to the question of what and whose knowledges are relevant to our collective future making. Only by engaging critically with that history can we extricate ourselves from what are arguably the extraordinarily repetitive terms that have been available to us for articulating processes of change. In writing about innovation’s relocation, my argument is that design needs to acknowledge the specificities of its place, to position itself as one (albeit multiple) figure and practice of transformation. 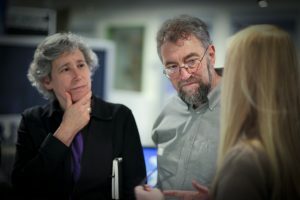 Bio: Lucy Suchman holds a Chair in the Anthropology of Science and Technology at Lancaster University and was Principal Scientist at Xerox’s Palo Alto Research Center, where she spent twenty years and was manager of the Work Practice and Technology research group. Her books, Human-Machine Reconfigurations (2007) and Plans and Situated Actions: The Problem of Human-Machine Communication (1987), both published by Cambridge University Press, have been recognized for providing intellectual foundations in the fields of human-computer interaction (HCI) and artificial intelligence. In 2002 she received the Benjamin Franklin Medal in Computer and Cognitive Sciences and the 2010 ACM SIGCHI Lifetime Research Award.